Enjoy stunning views of the PA Grand Canyon and Pine Creek from this well-appointed cabin. Sleeps up to eight comfortably (linens included), open floor plan with fully-equipped kitchen (all you need is groceries! ), comfortable bathroom with towels included, washer and dryer, Wi-Fi, TV, DVD player with DVD's, books, ping pong table, volley ball, ceiling fans and floor fans, large deck with beautiful views (deck furniture included), gas grill, canoe with life vests and paddles. Sits close to Pine Creek, Marsh Creek, and the Pine Creek Rail Trail. Just a short walk from the wagon ride and a local tavern/restaurant. Just a short drive to historic downtown Wellsboro, restaurants and other area attractions. 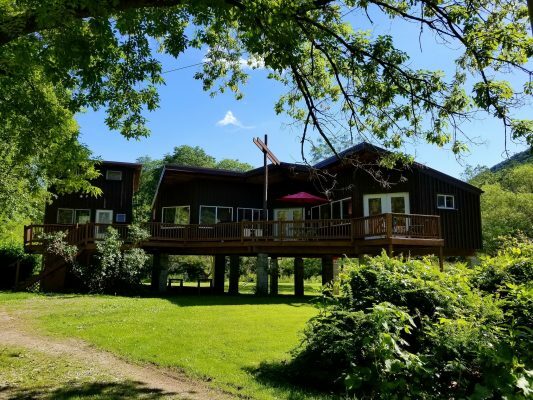 Pine Creek Cottage has everything you need for a relaxing getaway or an outdoor adventure!